THE SENSEI CULT. By Mike Clarke. SWEEPING TECHNIQUES By Nathan Scarano. WALL TRAINING - (Part Two). By Timothy Hanlon and Ann Davenport. FINDING YOUR OWN WAY.By John Cheetham. I am very proud to feature in this edition of SKM an interview with one of the most senior Shotokan masters in the world. Tsutomu Ohshima is the Chief Instructor to the largest Shotokan group in America, the SKA (Shotokan Karate America). Ohshima was the first senior Shotokan instructor to reside in the USA, (1955) even before the JKA contingent of Nishiyama and Okazaki who arrived in 1960/61 respectively. Ohshima sensei came through the Waseda university group and was never involved with the JKA movement, who's idea was to develop competition, in fact, in complete contrast to the Waseda/Keio groups. 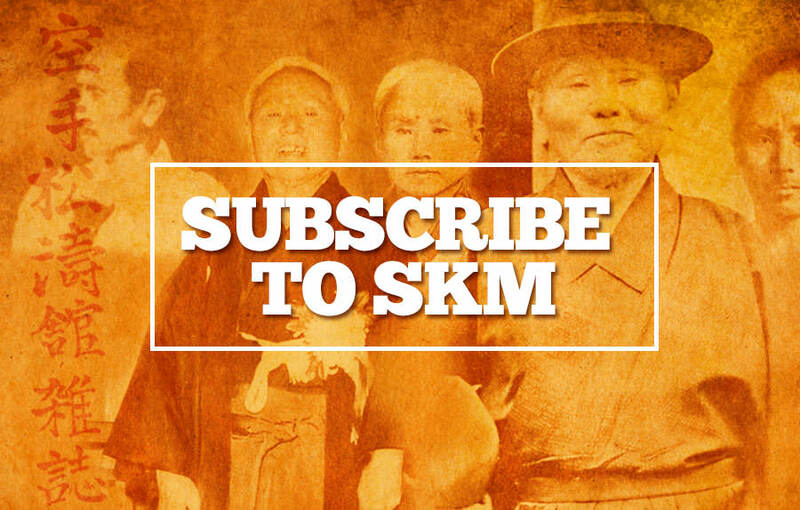 A special thank you to my friend Jose Fraguas (CWF Enterprises Los Angeles) for conducting the interview for SKM. As many older masters are sadly passing away it is vitally important that we hear the words of this last generation of karate pioneers. They are our last direct link to the past and we must treasure such people who actually trained under Master Gichin Funakoshi the founder of Shotokan karate-do, at some time in their youth. 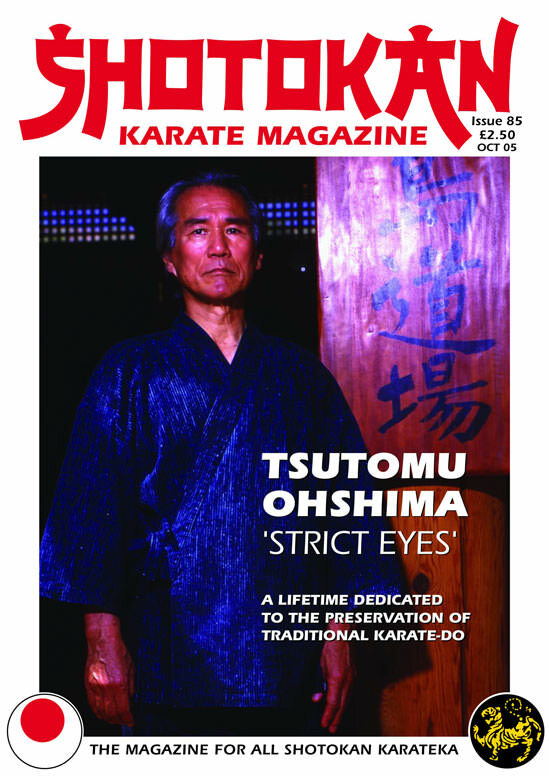 Still actively training and teaching to this day, even in his mid- 70's, we need to listen carefully to what Ohshima sensei has to say, because some of the concepts he talks about in his interview are extremely thought provoking and fundamentally different from today's modern, sport orientated approach to karate training. The technical and tactical principles and especially the budo philosophy of traditional karate-do must be preserved at all costs for future generations even if new ideas and concepts do emerge as time passes - which is natural. Modern concepts of course have their place, and some feel that traditional karate is a dinosaur. I feel extremely sorry for those people because they are missing the overall picture, as Ohshima sensei clearly describes with a burning passion. Traditional Karate has molded Ohshima's entire life and is the art and tradition he continually tries to preserve. I personally think this interview is a gem! The beauty of SKM being apolitical, is that we can feature everyone from the many various factions within the Shotokan karate family, without bias! Mike Clarke's article may possibly rattle a few cages, especially amongst professional karate instructors. I do see Mike Clarke's point though - especially regarding the 'quality' of instruction. But I feel that many of today's professional instructors (in Traditional Karate that is) are doing a great job teaching the art and trying hard to maintain traditional training standards, concepts, values, etiquette and discipline and are still changing many lives for the better. The late Kase sensei said that to become a professional karate instructor was all he ever wanted to be. Had it not have been for such professional instructors, I think many of us would probably not be training today. Karate has been a 'business' for many years. In truth about 80% of people practice karate as a twice a week hobby/sport and not as a way of life! However, I firmly believe two nights of traditional karate practice is far more life enhancing than say two nights of circuit training, squash or similar sports. FINDING YOUR OWN WAY. Make Karate Suit Your Own Body/Personality. By John Cheetham. I remember something Kagawa sensei said on an SKM course a couple of years ago. He said, "You should develop the basic techniques the best you can then make karate your own style, to suit your own body." Now, how many people really do achieve that? A lot of students are just poorer copies of their instructor and that is a fact. You see it all the time. I can vividly remember in the 1980's, so many people were trying to copy the style of, and emulate Frank Brennan the former KUGB kata and kumite champion and I bet many people reading this in the UK will be smiling now because they know that is true! Frank had (and has) his own unique style of Shotokan for the very reason Kagawa mentioned above. But everyone wanted to do Shotokan like that at the time and to be honest not one person I saw came near it. The same thing happened earlier when Enoeda and Kanazawa first came here, people tried desperately to copy their unique styles instead of doing what all good instructors tell students and that is to try and understand the physical principles of the techniques as opposed to just blindly copy someone else's body movement. Of course at first we do copy our instructor, that is obvious but after many years of basic training we should be looking to make karate fit our own body and not the other way around. I think many injuries have been caused by students desperately trying to copy their sensei even if their own body is not physically capable of coming anywhere near to their technique. 'Finding your own way', (physically) means making correct technique fit your own body's capability. This concept also applies equally to which path you follow as regards to training preference. For instance some people favour the out-and-out JKA type training e.g. kihon-kata-kumite, with no bunkai practiced (or very little) and a strong emphasis on basic training. Whereas others favour more kata application based training, more realistic self-defense etc. Some prefer a balance between the two and so on. Here again you have to, 'find you own way'. Personally, I like all forms of kumite and I could do impact training on bags and pads all night and never get bored and I do like the balance of the three K's, and I never tire of trying to get a nice 'feeling' for a kata. So, ideally you need a dojo (and karateka) with similar preferences. I think that this is why certain students stay with one instructor for many years and others don't. If that instructor's training methods suit you personally then you will stay with them. If you get a taste for something different then you will eventually move on. However, many people have made the mistake of thinking that the grass is greener on the other side and often regret leaving their first dojo/instructor, yet other times, it works out for the better! Someone asked me recently, "Do you practice grappling?" I sort of felt guilty saying, "Well actually, no!" I know it makes good sense to practice grappling from a self-defense angle but it holds absolutely no interest to me whatsoever. I just don't fancy rolling around on the floor with some hairy monster, the idea does not appeal, although I appreciate that an all round martial arts knowledge is no bad thing. However, like thousands of other karateka, I know what I want from training now after all these years and I know what suits me, I'm finding my own way. You have to find out what you want from karate (only after years of hard basic training of course) then you can 'focus' on that. Better than being a 'jack of all trades, master of none'! Very few people are able to become very good at a variety of martial arts, each art is a lifetime task. People who focus on traditional karate training (and philosophy) are very often criticized by the 'street-self-defense -brigade', and I do see their point sometimes. But I always remember what Osaka sensei said when asked, "What would you do if you were attacked in the street by two muggers?" He smiled and said, "Oh! I'd have to take my chances!" Tom Kompier, a really excellent Shotokan sensei from the Netherlands (who incidentally is featured in the next issue of SKM) asked me a question after I had trained under him at his dojo in Amsterdam recently. He asked, "What is your overall favourite Shotokan video/DVD?" I had never thought about that before because I like so many. At first I was thinking about videos/DVD's by individual instructors but then I knew what it was. And it was not the video of an individual, it was the JKA 26 Standard Kata video (three volumes), where eleven of the top instructors (before the split at the JKA) perform their favourite kata. The reason why this is my favourite is because of the varying body-types and shapes etc. of all the different instructors performing those kata. Each one has found their own way, their own style of Shotokan even though the principles of their fundamental, basic techniques are in fact the same. But because of such varying body types, they each have their own particular flavour for the kata. Their own interpretation, feeling, emphasis etc., and there lies the magic for me. They are not clones, each one of those brilliant instructors have found their own way of performing kata. You also see their own habits and ideosyncrasies, (even their flaws). They have simply made karate suit their own body's. Making karate suit your own personality is perhaps a more western type idea but surely this ties in closely with preferences in training regimes? If someone is a naturally aggressive type even though mellowed by years of karate training, then they will favour an attacking approach, whereas a quiet passive type of karateka usually is defensive by nature, instructors see this all the time I'm sure. Some even say that each of those two types should try to develop the traits of the opposite one. But it's very difficult I think, more so for the passive person. Terry O'Neill used to say that the problem with karateka is that they become too nice! He said it develops good character in practitioners and they can lose the nasty streak that is needed in real life-threatening situations. Peter Consterdine, a self-defense expert in the UK says that there is nothing at all wrong with traditional karate training but only questions whether we could cope with the pressure of real confrontations, simply because we don't do that type of training in the dojo, e.g. screaming obscenities at each other, spitting etc. But this is getting back to what type of training suits you as an individual and whether you want to do out-and-out street scenario training or concentrate on traditional karate. Of course many people now mix the two and there's nothing wrong with that but for me the dojo is not the place; it's a special place I feel and not a place for crudeness, brutality and swearing etc. It's all down to what you want from karate? You have to 'find your own way' and make karate suit your own body and your own personality. If this article comes across as being very western in concept (choosing what you want from karate) it's because I'm English and not Japanese and there are obviously cultural differences.